The Manager's Dilemma provides a framework and set of key concepts enabling leaders to exert their influence over the difficult choices and competing priorities they confront. 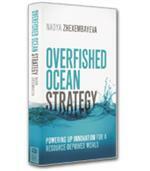 Compelling stories and vivid case studies help to deliver a serious game plan to any leader who is grappling with burnout caused by the manager's dilemma. Balancing the equation is the first of the two big phases that managers must achieve to effectively emerge from the manager’s dilemma. 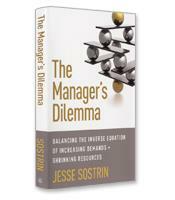 Sostrin offers four principles, explored in detail in the book, that will guide managers in balancing the equation. The first principle is to follow the contradiction. Contradictions, explains Sostrin, are subtle clues that tell the alert manager something is wrong. Rushing your work because you have no time to slow down, only to spend more time fixing the mistakes in the rushed work is a typical contradiction reflecting the manager’s dilemma. Once alerted, the other three principles help you move out of the danger zone: Determine your line of sight; in other words, focus on the right priorities. Distinguish your contributions; that is, know your strongest value-added capabilities, and use those capabilities over others. And plug the leaks, i.e., the ongoing experiences that reduce performance by draining your TERF. The first principle is to create the conditions you need to achieve more value. A sample of such conditions, according to Sostrin, includes flexibility, openness to diverse ideas or a willingness to innovate even if it requires letting go of the past. The second principle is to find the pocket of influence. The issue is timing — learning the optimal time to take the bold action required. Sostrin’s third principle is to convert your challenges to fuel — in other words, turn setbacks into opportunities for learning and performance. A tool called the navigation map makes this possible. Finally, Sostrin urges you to make your goals their priorities. This last principle entails building a mutual agenda with your team. Scenarios, examples and tools in The Manager’s Dilemma support this solid eight-principle methodology for addressing one of the core barriers to management performance: too little resources for too many demands.